The new Earth Fare in Huntersville, NC opened just four days ago. I am so thrilled about this, because the other Earth Fare in Southpark was a 30 minute drive for me. Now, I can get to the one in Huntersville in half that time! I had a chance to visit the new store for the first time today. I think everyone else in Huntersville had the same idea. It was packed. Apparently, I’m not the only one in town who is excited about this. Fresh flowers and produce greeted me upon my arrival. 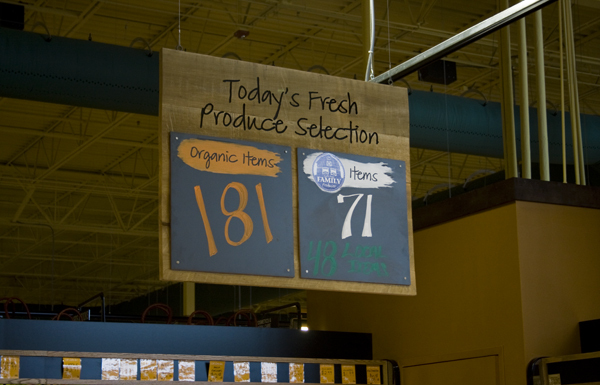 Flying high, is a sign that lets you know how many items that are currently organic, conventional, or local. 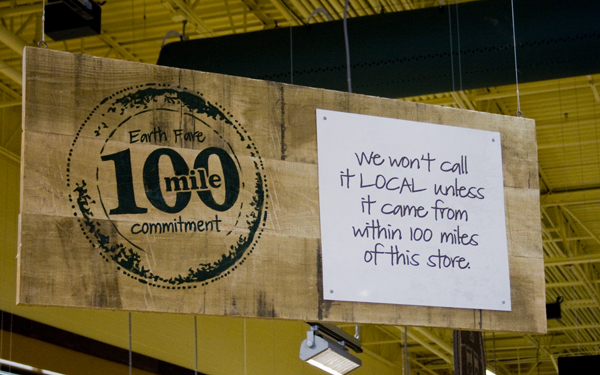 An important part of Earth Fare’s mission is to provide food without anything artificial. In addition, they provide meat that doesn’t have added growth hormones or antibiotics. The items that are labeled house prepared are made fresh daily in the store. It all looks so good! I could see myself getting one of these items after a long and tired day at work. Really, all you would have to do is pop it in the oven, or on the grill and there wouldn’t be a big mess to clean up afterwards. They also have a great seafood selection, all with labels that indicate whether it’s natural, wild, or other. I had a sample of the smoked trout and it was so delicious! I am definitely going to get some when I go back. There were plenty of samples around the store. Earth Fare includes items for those of you on a gluten-free diets, and wee little ones too. Earth Fare has tons options for gluten-free diets. You can easily recognize gluten-free products by their wooden shelf. All other shelves will be the standard metal. Moms will be happy to know that Earth Fare carries natural and organic products for their kids. Stay tuned for my favorite sections of the store. Oh yes, there’s still more. Get excited! !